The full handwritten catalogue of Nazi number two Hermann Goering’s huge collection of stolen art masterpieces is to be published for the first time on Wednesday. Kept in France’s diplomatic archives, the document, which includes notes on which Jews the works were confiscated from and where they were sent, was until now only available to scholars. The entire list will be published in The Goering Catalogue, published by Flammarion. It is hoped the work will help in the battle to return looted art to its rightful owners and their descendants. Hitler’s right-hand man committed some of the most heinous crimes in history. But he went to great lengths to be surrounded with beauty, exploiting his power to loot some of the world’s most fabulous works of art to adorn the walls of Carinhall, his country retreat near Berlin. His collection has been the subject of several books, whose authors have sought to piece together the vast collection via wartime archives in the US and Germany, as well as Goering’s letters to his dealers and auction catalogues. The catalogue lists around 1,400 stolen art works, from Botticelli and Durer to Renoir and Monet, along with 250 sculptures and 168 tapestries. Paintings include Van Gogh’s Bridge at Langlois in Arles and Velasquez’s Portrait of the Infanta Margaret. Resembling a simple bookkeepers log, the tome sat on Goering’s desk in his office and is full of annotations written in five different hands. “Each time an art work was sent to Carinhall, his chateau outside Berlin, it was noted down,” Mr Dreyfuss told RFI. “It even notes in which rooms of his residence the works hung”, including two Renoirs in the dining room. Details included the name of the work, the artist, description and origin, with pieces coming from all over occupied Europe. “Above all, it details the origin of the collection, with most of these works pillaged from Jewish families, he said. Laurent Fabius, the French foreign minister and whose Jewish art dealer family had its collection confiscated in the war, said the register was being published so that “the general public has at its disposal this photograph of the biggest art collection of confiscated works along with that of Hitler,” whose looted collection contained 5,000 works. 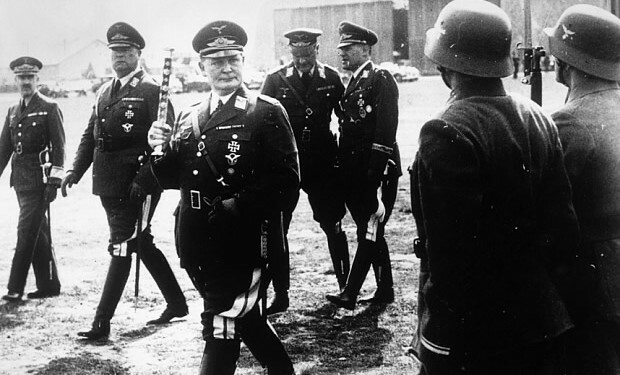 With the Allies closing in at the end of the war, Goering loaded his art collection into private trains and moved it deep into Bavaria, and then to the Austrian border. But the trains were intercepted by the Allies, sent to Munich and the contents inventoried. Goering was caught in Bavaria, and committed suicide the day before he was due to be hanged for crimes against humanity following the Nuremberg trials in 1946. The wartime hunt for stolen Nazi treasures was the subject of 2014 film starring George Clooney called Monuments Men.